Sit on the front of a flat bench. 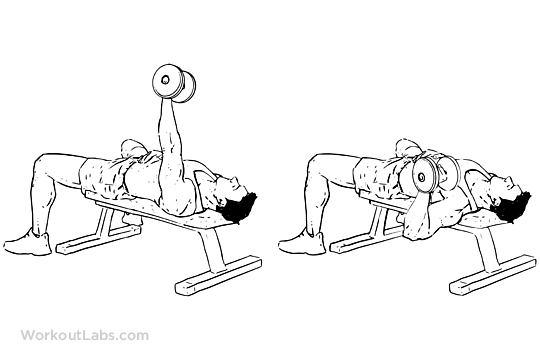 Hold a dumbbell with both hands. Keep your core tight and back flat as you slowly lie back on the bench. Brace your core and turn your left arm out with the dumbbell. Place your other hand on your core. Your upper left arm should be parallel with the floor. Push the dumbbell above you, in line with your chest. Keep a slight bend in the elbow. Slowly lower back to the starting position and repeat.